So it's one day later and I am already breaking my own rules. Because my book on Mad magazine imitations is coming out shortly I am sharing some stuff that is in there to attract attention. 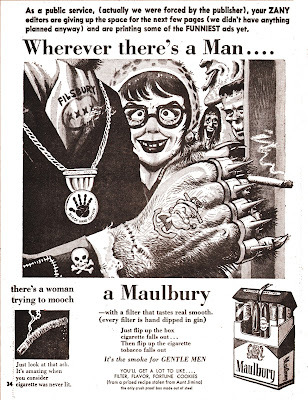 Today I have an advertising satire from Zany #3 by Paul Reinman. It is NOT in the book for several reasons. One is, that a proposed advertising section was scrapped due to the length of the book. Some ads did make it in, in another section, like one with Frankenstein by Howie Post in the Big Name Talent section. Another reason not to iclude it, is because although the book is not solely aimed at collectors I did not want to include material that was available elsewhere and this ad is one of the few samples from Zany that have been reused (and reprinted) in Cracked, also owned by Zany publisher Bob Sproul. In the book I go further into the relation between these two magazines and I offer an explenation why Cracked succeded where Zany didn't. Anyway, the reason to show it here, is that I am currently selling a lot of Sunday Section magazines, including some late fifties issues of This Week. While photographic them I saw the original inspiration to the parody and I jsut had to share it here. Ger, any info when your book on the Mad imitations is really coming out? I pre-ordred it a while back, and now Amazon says it won't be available till August 2017 (when it was slated for May). I'm rellay looking forward to it. As I understand it it is printed and on it's way now. We are all expecting it later this month and are looking into ways of promoting it at the San Diego Comic Con at least. I got the same info from Amazon. This sounds like I may be able to get it at Comic Con. Great news.